Imagine you and your family are safely tucked away in bed. Then imagine that you—or someone you love—is awakened by the smell of smoke, the piercing whistle of a fire or burglar alarm, the crackling quake of a large tremor, or the high speed winds and rain of a tornado or hurricane. Do you know what you would do? Does your family know what to do? If not, you should definitely think of creating—and practicing—a family escape plan. Formulating a family escape plan, in preparation of a manmade or natural disaster or tragedy, is not only a forward-thinking and responsible strategy, it may be the only chance you and your family have if you want to escape the worst a calamity such as this could potentially bring. To help you avoid a possible heart-breaking scenario, below we have outlined a comprehensive plan to ensure that both you and your family members are prepared for the worst possible situation—and ready to deal with some of the real consequences it may carry with it. When developing a family escape plan there are several steps you will need to follow, as well as a few things you will need to create. Below we have outlined the various steps for creating a clear and concise family escape plan that everyone can follow. Creating a map of your home is an essential step in the family escape plan process. Of course, both you and your family already know the ins and outs of your house, but a visual representation is necessary so that everyone is on the same page—so that everyone knows where to go and what to do in case of an emergency. This map, which can also be just simple blueprints if they are available, should include color-coded labels that mark every exit within your home, including doors, windows, hallways and staircases. You should also label and make known things such as fire extinguishers and the main shut off valves for utilities such as gas and electricity. Water. Water is essential to our survival. And natural and manmade calamities can cut off access to public water. With that in mind, do you really want to fight the crowds at a grocery store AFTER a disaster hits? Of course not. By keeping at least a case of water next to your emergency supply kit you will be able to stay hydrated until services are restored or until aid agencies like the Red Cross or United Way can deliver emergency supplies. Food. Food is another thing you will need to pack in your emergency supply kit—again, enough food to last you and your family about 72 hours when rationed. Non-perishable food like canned goods, protein and granola bars, crackers, and anything else that will not spoil or does not need to be cooked is acceptable. Cell Phone (Charged). At least one member of the family should keep a fully charged cell phone next to the emergency supply kit—or in a spot where everyone knows where to find it. As long as the cell towers have not been affected by the emergency in question, a cell phone can help you get important information as to what happened and what the authorities are recommending people to do, for example, relaying information about temporary shelters. It will also allow you to call family members and friends to check on them. Flashlight. If you are forced to leave your home in a hurry during the nighttime hours, you will quickly discover why a flashlight is so important in an emergency supply kit. Flashlights will help guide your way in the darkness if you or a loved one needs to go and find help. Extra Batteries. A flashlight is only as good as its batteries, so make sure you bring plenty of extra batteries just in case. Batteries are small and they won’t take up too much room in your bug-out bag. First Aid Kit. If someone in your family is hurt during an emergency of some kind, you may not have the time or opportunity to seek medical help. Therefore, you should always carry a first aid kit that contains some or all of the following items: band-aids, gauze/adhesive tape, Ace bandage, antiseptic wipes, aspirin/pain relievers, low-dose baby aspiring (for heart related problems), and any other first-aid item that is relevant to your family, such as insulin for a Type-1 diabetic or an Epi-Pen for allergy sufferers. An Extra Set of Clothes. Carrying an extra set of clean, dry clothes can help keep you warm if you are displaced from your home. Money/Credit Card. If you need to escape your home quickly, you may not have the time to grab your wallet or purse. For that reason, it’s important that you have cash or a credit card in your bug-out bag—money that can help buy extra supplies you may need to survive or weather the emergency. Copies of Important Papers. In a fire, hurricane or tornado, there’s a chance that everything in your home could be destroyed. That’s a tough pill to swallow, but that pill will be a little easier to swallow if you have copies (or the originals) of your important paperwork. Items such as birth and marriage certificates, life, home, auto and disaster-based insurance policies, deeds to your home and automobiles, school transcripts and diplomas and written notes you may want to save should be stored in or very nearby the location of your emergency supply kit. Pocket Knife/Utility Tool. You never know when you might need a pocket knife or utility tool when surviving an emergency, so it’s definitely a good item to bring along (it can also help open those canned food goods you brought along). Anything Else that is Important to you—as Long as It Is Portable. Memorabilia that is important to you, perhaps funeral cards, photographs, letters and pictures from your children, etc.—as long as it is portable and easy to move—can certainly be part of your emergency supply kit if you so desire. Fire Extinguisher. A fire extinguisher in the home can often prevent a small fire from becoming a devastating one. Make sure you buy a fire extinguisher that is rated for home use, and have it inspected by a professional at least once a year to ensure it is ready to use if needed. Ladder. For those families that live in a multi-level home, having a window ladder from which someone could escape in the event of a fire is always a smart thing to do. Ladders vary in price, costing from about $50 for a basic model to $100-$150 depending on material. While not officially part of the “Family Escape Plan,” getting in the habit of regularly checking your smoke detectors and carbon monoxide detectors is a good idea. A good majority of catastrophic fires, in which someone is injured or killed, happen in homes that either have no smoke detectors whatsoever, or have smoke detectors that are not working. Smoke detectors are there for a reason—to save lives—and it is up to you to ensure they are in proper working order. A good rule of thumb is to change the batteries on your smoke detectors every six months (some people change batteries each time the time changes—falls backs or springs forward), and test them regularly to make certain they are in tip-top shape. When creating your family escape plan, you will probably want to assume that each member of your family will be in his or her bedroom when an emergency strikes, just as they are during the middle of the night. Keeping that in mind, you will want to outline on your map the route and exit through which each person will escape. For those with multi-level homes, in which most of the bedrooms are upstairs, you may want to have a Plan A and a Plan B. Plan A can be the easiest route—for example, down the staircase and through the nearest door. While in Plan B you will need to assume that access is blocked, and thus create a plan for escaping through an upstairs window. 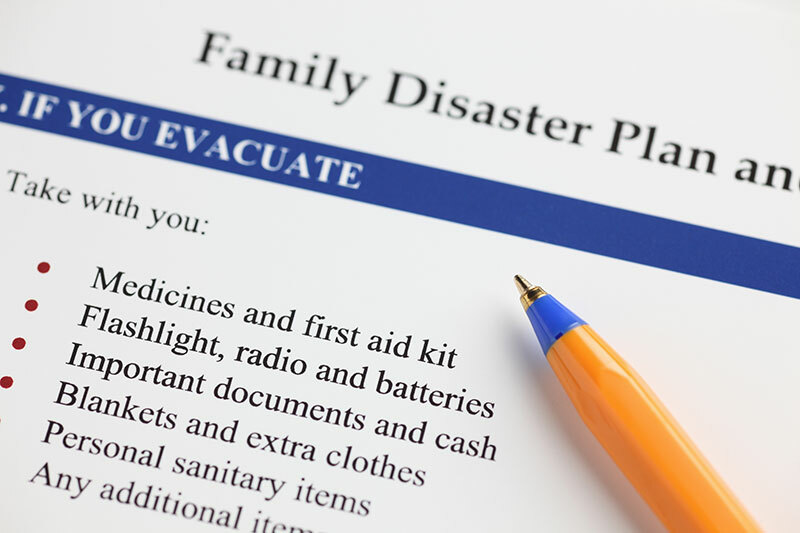 It’s important to know—and reinforce—the various responsibilities each member of the family will take on during an emergency. Naturally, in new families, where the children are very young, most of the responsibilities will fall to the adults in the household, but as children get older you may want to assign them one or two tasks so they feel needed. In extended families, in which senior or disabled adults are living among families, the “responsibility” section of the family escape plan may become a bit more complicated and complex, but it is still very feasible to create this list. Grabbing the Emergency Supply Kit. Depending on the size of the family, the emergency supply kit can get pretty big and heavy, especially when you consider the weighty case of water it contains. Try to leave this responsibility to someone strong—or perhaps to two different people, such as Dad/Mom and the oldest son or daughter. Placing the Ladder. This is a job best left to the adults in the house. If there are children who sleep upstairs, and the staircase is blocked by fire or knocked out, the first adult out of the house should put the ladders in place so that the children can escape. Older teens that may sleep downstairs can also be given this responsibility. Other responsibilities may come up as time goes on, so it’s important to update your plan about once a year to keep it current. Once everyone has successfully escaped the house, you will want to come up with a rendezvous point at which each member of the family can check-in. This could be a neighbor’s house, a school, a nearby monument or landmark of some kind, a park, etc. During some emergencies, when everything is chaotic, you’d be surprised how fast families can become separated, so having a central meeting point is a great way to put your mind at ease. It’s important to remember that not all emergencies happen when all your loved ones are safely in the home with you. In tragedies such as hurricanes and earthquakes, for example, in which some members of the family may be away from the home, it’s important to come up with two phone numbers through which everyone can check-in. The first should be a member of the local family—for instance; everyone calls the number of the phone that is near or in the emergency supply kit. This will let immediate family members know you are okay. The second number should be a friend or relative who lives in another state or city—somewhere that may not be affected by the same tragedy. This is another great way for everyone to check-in so that friends and loved ones know that everybody is okay. Now that you have committed your family escape plan to writing, it’s time for the family meeting. This is an important step for all families, but especially crucial for families who have small children. During the meeting, carefully go over the map of the house. Help children understand where their bedroom is in relation to the various exits in the house, and explain the preferred route they should take when leaving the home. Remember to have a backup route and exit for each member of the family, just in case the primary exit is blocked, and quiz them from time to time as to what they would do if an emergency struck. Children should also be taught about warning signals and sirens and what they mean. For example, some towns in the Midwest have sirens that warn of incoming tornados, essentially telling everyone to seek shelter. Explain the various responsibilities each family member will have, and encourage them by giving them an age-appropriate responsibility of their own. This will help them buy into the process. Go over the meeting place at which all members of the family will gather during or after an emergency. Also, have them commit the primary and secondary phone numbers to memory (this may take a while depending on age). Children with cell phones should put both of those numbers in their contact list for easy access. The best way to ensure your family escape plan will be successful and remembered is to practice it often. As the coordinator, try to mix in planned practices with surprise drills. And create different scenarios (fire, tornado, etc) so that they learn both the primary and secondary escape routes. Children who sleep upstairs should be taught how to climb down a ladder—just in case—as you don’t want their first time using a ladder to be the night of an emergency. Have everyone meet at the designated spot—a spot that is at least a block away from your home. Often in cases of fire and other emergencies, the authorities will tape off the immediate area, so make sure they know exactly where to go and who to call. You can even keep the practices fun by using a stopwatch and encouraging them to “break the old record” for speed. The important thing is that everyone learns the plan inside and out. Events such as tornados and earthquakes can strike out of the blue, and fires can spread through a house rapidly, leaving you and your family little time to escape. Having an escape plan is your best bet for surviving one of these events, and will help you sleep a little easier knowing that everyone in your family knows just what to do, just where to go, and just who to call.